Since my first child was born nearly 16 years ago, I’ve heard the argument that children shouldn’t have too much screen time. First, it was TV, then it was computers, and now the debate focuses on iPads, Kindles, and phones. The argument has taken many forms over the years. The generation before TV worried their children were spending too much time reading; a sin I am sure I’ve committed. My kids have learned all kinds of good things from screens, and I think video games can teach great problem-solving. So, I just don’t believe the hype about screen time being bad. However, I do have an issue with too much screen time. 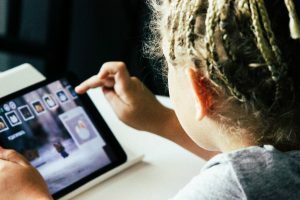 My issue is that when children are using a screen, whether it is a computer, TV or personal device, they aren’t doing other things. And those other things, have a lot of value. Time spent with a screen is time spent not playing or reading. Time spent watching videos is time spent not stacking blocks, catching balls, or using their imagination. Screen time requires minimal use of gross or fine motor muscles. Muscles that children are supposed to be developing through play. Let’s compare apples to apples. Compare playing a board game on a personal screen vs. playing one at the table with family. In the scenario, with the actual board game, the child has to open the box and get out the pieces. The child uses various amounts of motor control and problem-solving as they lay out the game board, put out any cards or tokens, and set the game pieces in the right places. “I want to be red,” says brother. So the child has to find the red tokens and hand them over. The game takes five minutes to set up. But during that five minutes, the child uses muscles in every finger and the entire arm. For bonus points, the child is sitting up, using core strength to hold themselves up in a chair. In contrast, setting up the game on the personal device involves a few flicks of one finger. Then, each player is assigned colors and tokens in one quick tap. The child has no reason to problem solve at all in this setup. Total muscle use centers on one finger and the setup and gameplay may even be done while laying down, using no core strength. 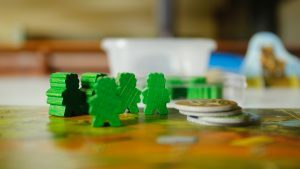 With the tabletop game, the benefits continue throughout the gameplay. Visual scanning of the full sized game board requires a different level of eye control than that used while looking at the screen. Eye muscles needed for everything from reading to driving are getting a better work out. On the personal device, the software may move pieces for you, eliminating the need for hand-eye coordination of moving a token the correct number of spaces. 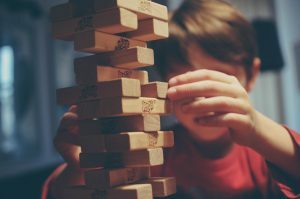 With a tabletop game, every time something needs to be moved, your child’s brain is working to control her muscles. As an occupational therapist, the board game is superior for helping the child to grow and develop. As I said, I don’t think screens are bad. I just see it as my job as a parent to limit screen use so that my kids do other things. It is the high value I place on playing, crafting, and cooking and the coordination and motor skills they develop that makes me set limits, not the suggestions of the American Academy of Pediatrics or any other group. 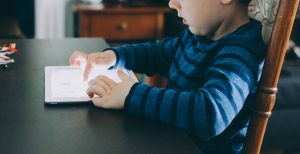 My kids are developing muscle coordination to last a lifetime, and it needs to be more than being able to swipe their finger across a screen.